With only a few legal options for accessing TV programs and movies over the internet--pay upfront (Netflix, Amazon, iTunes) or sit through advertisements (Hulu)--it was inevitable that an alternative model would emerge. 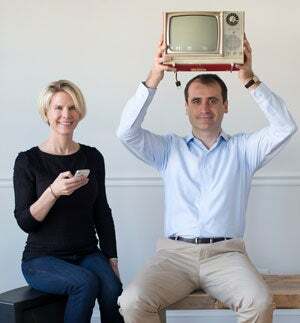 HitBliss, an online streaming site developed by husband-and-wife team Sharon Peyer and Andrew Prihodko, offers popular shows like NBC's Battlestar Galactica and hit movies from the likes of Paramount Pictures, Focus Features and Universal Pictures. Users can purchase titles from the HitBliss Store for roughly $4 per movie or $2 per TV show. But the revolution starts with the HitBliss Earn service. Viewers in Earn peruse the same titles but sit through advertisements to bank money--about 25 cents per ad viewed--that can later be used in the HitBliss Store. To earn payouts up to twice as quickly, Earn users build a profile, adding their location, gender, age, income and browser search history. With that information, HitBliss can match a viewer to an advertiser's target demographic and ensure that the ad gets seen. How? Prompts appear in ads that require the viewer to click on it. The faster and more consistently a viewer clicks, the fewer prompts they see, and the faster they earn credits. Put simply: Brands such as Aflac and Dr Pepper are paying people to watch and listen to their messages on HitBliss. To ease the marketing assault, HitBliss does allow viewers to skip or remove all messages from a particular brand--but they pay a penalty by sitting through more ads from other sponsors. "Instead of relying on the old model where the advertisers pay the content owner, we let the advertisers basically reward the users for their time and attention," Peyer says. "And viewers are rewarded with the ability to actually get what they want." Peyer and Prihodko came up with the idea while working on their previous venture, Pixamo, a photo-sharing company that had a free, ad-supported component. They recognized that the ads were being mostly ignored and concluded that targeted advertising would be more effective, and possibly more enjoyable, if users were able to control the experience. "That's when we realized we wanted to create a model that just involves the consumer and the advertiser," Peyer says. After selling Pixamo in 2007, the two focused their efforts on developing Lexington, Mass.-based HitBliss, which launched in private beta earlier this year. While the company's film and TV library isn't yet as robust as those of its more established competitors, it does stream movies four months after they leave theaters, up to a year earlier than Netflix--which had revenue last year of a whopping $3.6 billion. And when the service exits beta later this year, Peyer and Prihodko expect to be able to offer it on smartphones and internet-enabled TVs. Time will tell if HitBliss becomes the new answer for ad-supported streaming media. If successful, its model could apply to the likes of Pandora, gaming and other online entertainment, reshaping the public's idea of "free" media.